While the genre of mourning pages is an interesting one, 2 what catches my attention about this example is how the black ink lets us see what we usually don’t. The page, as many of you noticed, is not simply black. There are lines going in multiple directions and even the suggestions of words. There are vertical lines, close together, running all the way across the image, and a few horizontal lines, although those are a bit harder to spot. My favorites are the slightly curved lines running diagonally from the bottom left up to the right and, barely visible in this image, running diagonally from the lower right up to the left. There’s also a shift from dark black on the outer edges to a lighter black in the middle, and the little dark blobs with light halos scattered around. And then there are shapes that look like letters and words running horizontally, especially noticeable at the top and in the middle of the image towards the left-hand side. So what are these things? 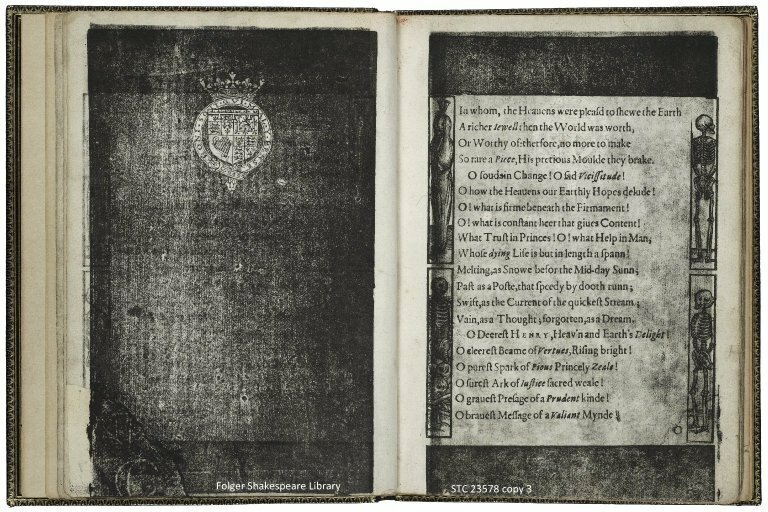 One key to working this out is remembering that the black page is made by printing a block of wood covered with black ink, with the coat of arms carved out so that it remains white. (See Erin’s post on illustration techniques for a refresher on how that works.) Anything that’s not in flat contact with the block won’t receive the ink. The second key point is that sheets of paper aren’t actually flat. Since paper in this period was made by dipping wire screens into vats of rag-and-water stuff, with the solid stuff settling onto the screen as the water passes through it, the resulting paper bore the imprint of the wires on its surface (see another post from Erin that helps show this process). And once a sheet of paper when through the press, the type debossed the surface of the paper as it was pressed down onto the type, marking it not only with ink but with impressions. Put those two observations together, and you’ve got what you see above. 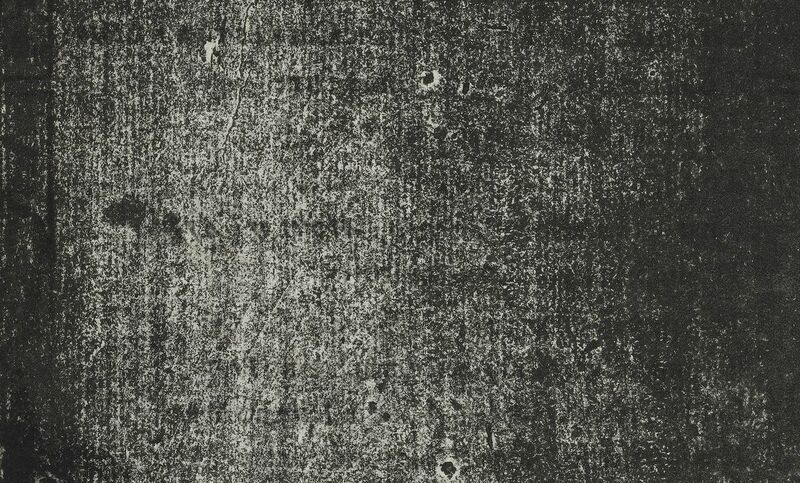 The vertical lines are from the wire lines (the wires forming the body of the mold): the wires indent the paper, leaving tiny little hills between the impressions that pick up the ink. The difficult-to-see horizontal lines come from the chainlines, but since those come not from wires biting into the paper but from a series of knots sewn onto the wooden ribs stabilizing the frame, they don’t leave indentations and so don’t create valleys that escape the ink to the same degree. And what’s happening with those lovely curved lines? Those, as Jan Kellett noticed, come from the grain of the wood that makes up that woodcut. Once there was a tree, and it grew according to the seasons, marking that growth in its rings. When the tree became a piece of wood that was used to print a book, it carried along those signs of its life, a slightly uneven surface that left its secret story behind in the ink. This is a book of poems mourning the death of an eighteen-year-old prince, a book that wears its heart on its sleeve. And yet underneath that surface are signs of growth and life. Can we bring that life back to the surface? How do we mix what we read with what we see, and what we see with what is underneath its surface? I don’t have the answers, but I love that this image makes me ask those questions. I focused here on the past of this book, the processes that it went through as it became a book, but there’s more to be said about what happened to its material life after it came into being. I’ll write about its (not-so-secret) future in another post! For more on the outpouring of grief in print on Prince Henry’s death, see Cambridge University Library’s exhibit on “Mourning Prince Henry”. 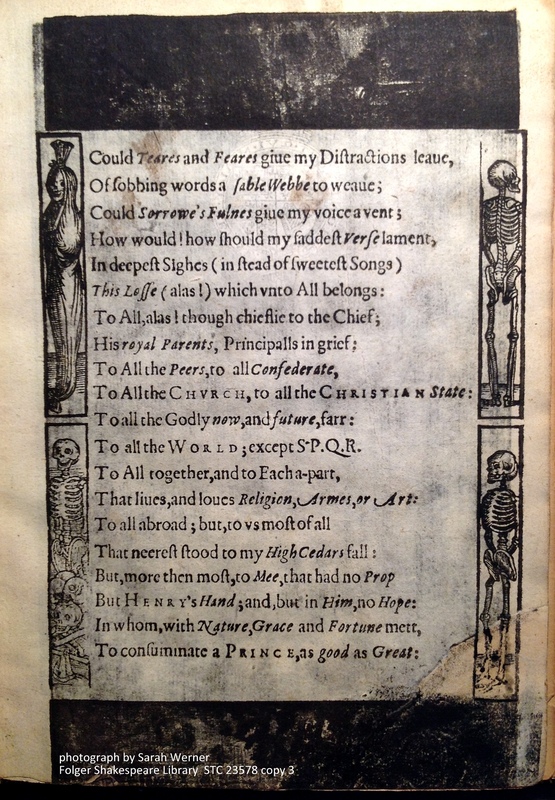 See Whitney Trettien’s post for other examples of mourning pages, including the one in Tristram Shandy. R. MacGeddon [pseud. Randall MacLeod], “An Epilogue: Hammered” in Pete Langman, ed. Negotiating the Jacobean Printed Book (Ashgate, 2011), pp 137-99.